Nestled on the 24th floor of the Empire State Building, MetroNaps has become a haven for the stressed cubicle dweller. 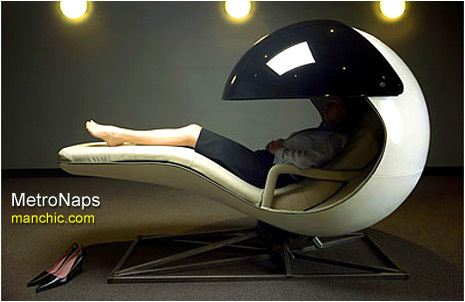 For $14 a pop, the budding enterprise offers 20-minute naps that guarantee to leave the customer feeling rested. According to the MetroNaps Web site, which bears the alarmingly Orwellian catchphrase "Welcome to the future of workforce productivity," MetroNaps "was born from the realization that many employees spend significant amounts of their day dozing at their desk or catching powernaps in odd places." Celebrity Chef Yoram R. // L.A.
ManChic claims no credit for any images featured on this site unless otherwise noted. All visual content is copyright to it's respectful owners. If you own rights to any of the images, and do not wish them to appear here, please contact us and they will be promptly removed. ManChic is in no way responsible for, or has control of, the content of any external web site links. Information on this site may contain errors or inaccuracies; the site's proprietors do not make warranty as to the correctness or reliability of the site's content.